The interior d´cor is contemporary with light wood flooring and wall panels, cream colored and luxury furnishings. The open salon offers multiple seating areas and features a wet bar, 3D TV entertainment center, formal dining, and wide sliding glass doors leading to the aft deck. The large windows create an airy light ambience by day and at night the upgraded lighting with blue accents create a feeling of refined luxury for socializing. She is fully air-conditioned throughout. Refit2012 (and upgrades in 2015/6/7) to Include many technical upgrades and Exterior: topside paint, synthetic teak on stern scoops, courtesy blue LED step lights, underwater lights, spreaders spot lights (2x 3), new Spade 80kg anchor, laminated square top mainsail and genoa in spectra & kevlar, all new hydraulic hoses, hard cockpit shade with solar panels, new trampoline nets, all new running rigging, new external cushions and upholstery. Electronics: new radar B&G, integrated Simrad chart-plotter, AIS, autopilot, HI-Fi Harmann Kardon, TV, 3x iridium lines with data, Rogue wave Wifi booster. Engine room: full revision of all systems, including AC, watermakers, new 8 kw Kohler generator hi-pressure wash, new motors on furlers, on watermakers. Interior: all new LED lighting, new saloon and master cabin upholstery, all new induction kitchen, dish washer, laundry/drier machine, microwave, chart table instrumentation and electrical panel, all new branded linen, table cloths towels. In 2015 and 2017 new cushions for the trampolines & sunbeds, plus shades for the stern area of cockpit. 2017: new class A freezer, purified chilled and sparkling water machine, new wine cellar, new boilers, new mattress, new external cushions and sunmattress, new toilet hosing, Lofran windlass, new bluetooth receiver for internal/external hi-fi (in order to get the music from the guests´ smartphones), hauling the boat, making a deep service. 2018 new washing machine, new induction hob, (..
Free WIFI access via antenna amplifier when connected to any public hotspot on land even if they are quite far. In case of urgent necessity a satellite connection is available at cost. BVI -we have a powerful WiFi repeater, that can warrant unlimited WiFi when we are close to the Islands. 5 Hairdryers on board - no need to bring yours! Please ask if guests wish to bring their own electrical devices as the devices must be able to change from 110 volts to 220 volts. Sagittarius has converters but the devices have to support 110/220v. If the device is made only for 110 volts it will not be possible to convert to 220 volts. For all other plugs such as a phone charger Sagittarius has plug adapters. We have full water ski equipment both for adults and juniors. 2 Stand Up Paddle Boards (one 14 feet x 8´ for couples or heavier weight, and one fast 11 feet x 6´ for high performances). Three sun bathing areas (two queen size and three single size in the roof, total 7 pax). Two inflatables (3 seat banana and 3 seat sofa) and an inflatable high performance knee board. Dinghy has Honda 4 stroke engine with roll bar for wake-board and tow-ring. No fishing in BVI Waters; Fishing in US Waters only. Cristian and Ilona are both Dive Masters. Winter Season 3 crew: Christian, Ilona and Chef Jack. Cristian Sequenzia, friends call him Cri (pronounced Cree), is the descendant of a proud and storied ancestry. He grew up in ancient Ortigia, a UNESCO World Heritage Site. This historic island is at the heart of the naturally fortified harbor of Siracusa, Sicily, Italy. It is the birthplace and homeland of many famous seafarers. Cri, with his knowledge and passion for seamanship, is a credit to these forefathers. Cri was sailing with his father as far back as he can remember. He had his sea legs before he could run, and was swimming, diving and fishing as a small boy. After college, he went to work for a company that manufactured special parts for yacht construction. He specialized in carbon fiber composites, learning about yachts from the earliest stages of the build process. In 2012, Cri brought his expertise to Sagittarius’ extensive refit. “When I had the offer to start working on Sagittarius I didn’t think twice. I quit my job to spend a year and a half on board, eight months of refitting and 10 months sailing around Europe and the Caribbean. I love sharing my passion for the sea with our guests; diving, snorkeling, swimming off secret beaches, exploring remote coves, pointing out turtles and birds´ nests. I also love having fun water skiing, wakeboarding, and every kind of fishing.” With his many talents and joie de vivre, guests on board Sagittarius are certain to love sharing in all the fun too! Ilona grew up in an idyllic setting, in a storybook Czech village surrounded by woods. The family’s daily routine included caring for lots of animals and tending the garden. They shared a deep love and respect for nature, animals and people. Ilona’s parents had built a canoe, and the family enjoyed most holidays on rivers and lakes. Together they spent time canoeing, camping and fishing. Ilona got her first fishing license when she was just 10 years old, and she has been fishing ever since. Today, she happily shares fishing and fish prep tips with interested charter guests. Ilona is very energetic. She excels at all types of sports, including tennis and swimming. She modestly mentions that she “collected a few trophies in snow skiing competitions in the Czech mountains”. She is also an avid diver with many certifications including Rescue and Deep Diver, and has achieved Yachtmaster Coastal Certification. She is a very patient instructor with guests of all ages interested in learning to snorkel, or manage the yacht toys. Family charters are her favorite, organizing activities for everyone to spend quality time together. Cristian “Jack” Zoppelletto, grew up with two brothers in a hilly town in the north of Italy. He spent his childhood with family and friends by the sea in coastal Italy, boating, fishing and swimming. He went camping in the beautiful Dolomite mountains, climbing in the Alps and enjoyed collecting mushrooms and cooking. Jack remained in his hometown of Vicenza for 30 years, working as a chef and as a restaurant owner, until accepting a position and moving to beautiful Lake Garda. Later he enjoyed prestigious positions as a chef, partner, owner and culinary instructor in Courmayeur, Fort Lauderdale, Miami and Barcelona. He attended the Instituto Technico and further expanded his expertise with professional cooking classes, a sommelier and finger food course. While in Barcelona, he organized and taught Italian cooking courses. Jack says, “I started as a yacht chef in 2014 because I love the sea and the Caribbean atmosphere, culture and very interesting local lifestyle. Plus, fishing, and preparing fish, is a favorite pastime. I find wonderful, fresh products in the markets too, especially fish. I like cooking all international dishes, but being Italian, I specialize in Mediterranean recipes. Guests are very excited with my typical Italian cuisine.” In fact, guests tend to rave about everything Jack sets on the table. For foodies, a charter aboard SAGITTARIUS is a superb culinary experience. For guests interested in taking home a few cooking tips or recipes, Jack is super enthusiastic about teaching, and loves to share his knowledge and expertise. Whether guests are keen on a real hands-on experience, or prefer to discuss worldwide cuisine and culinary trends over a glass of specially selected wine, Jack is a consummate host. Offer: June through October, 2019, 10% off on all week + charters. Send us an inquiry to get specific pricing for Sagittarius. Congrats and thanks for making this such an amazing trip for these families- they are super experienced charterers all over the world so I feel this is quite a compliment to have such a positive review! Remembering the trip ... all I liked - the size and condition of the vessel, Captain Christian, responsible, punctual, Ilona Stewardess very attentive, friendly and helpful, the chef Jack funny, friendly excellent his food, nice company of three on the weeklong trip. The welcome was very warm and immediately define the course of the trip according to the weather. Size very comfortable - like bathrooms and space to organize luggage room. Ilona was always very timely to clean them and keep them tidy, we did not even realize what time it was. The table was beautifully set for different meals, which were first class, the chef was brilliant every time. The crew were always attentive and happy, interested to see what we needed to have, fun and meet our requirements. Internet - they once solved it with their own equipment. We ask sail at night and it was a 3 hour trip unforgettable. Our sail captain Cristian gave us a lot of confidence and we saw he was in control. Definitely we recommend this boat and its crew. Our trip on Sagitarius was wonderful. The crew made it all come together and even provided much entertainment when it rained. The meals were wonderful. We never felt unsafe for one moment with our Captain Christian because he was observant of ever thing around us and we did not have to worry. Ilona the first mate was the most superb in her attention to everything and every detail that we felt like we were on a mega yacht. We highly recommend this crew and the yacht Sagittarius as the two combined made for an extraordinary and exotic charter. 15-23 February, 2018 ~ BVI´s ~ Loved the Entire Experience! The captain was super! He dealt with a port engine problem allowing us to continue our cruise (minor problem - repaired and now fully operational). As for the crew, a person couldn´t have asked for better service from all aspects of their duties. Great work and great people. The itinerary was 5 star, we couldn´t have asked for more. Chef Riccardo was very good as was his meal planning. Alexandra´s customer service at the bar and overall attention to us was outstanding. Couple that with her sweet personality she is an asset to any crew. We loved her! We all loved the entire experience of our trip! The food and service were brilliant, nothing was too much trouble. 8-15 May, 2017 ~ Grenadines ~ A Memorable Week! It seems very strange to us not to be in your company and on the boat anymore!It is certainly more boring and quieter on land!!! We miss you all! Thank you so much to all of you for making such a memorable week for us. We really enjoyed everything and particularly the sunsets and quiet bays!!! Very beautiful and unforgettable. Thank you again for all your very hard work.......We hope you have now manage to have your party and some well deserved sleep?! We are now just chilling in Mustique for a few days and will do some tours at the end of the week. When we get home, we will sort some photos of our week to send to you.Looking forward to meeting you hopefully in October in Alba. Many thanks again for such a special week.Hugs and best wishes to you and your great crew. 26-30 March, 2017 ~ BVI ~ Wonderful! Just thought you would like to know that Stacey sent me a very nice text this morning. They had a great time on Sagittarius and specifically stated the crew made the trip wonderful. Thank you for all of your help and efforts in pulling off a last minute miracle with fisheries! March 18- 25, 2017 - Absolutely Outstanding! Hello Sagittarius Crew, Thank you so much for all your hard work in making what sounds like an absolutely outstanding charter experience for my clients. Please find below a their wonderful review. It was a pleasure working with you. The Charter was amazing in every way. The Catamaran was beautiful, the crew was an absolute delight and we definitely have decided that any future vacations will have to be a charter. Please see my responses to the evaluation questions below. Again, we cannot say enough good things about our experience aboard the Sagittarius and the exceptional crew. Were you able to locate and board your yacht easily and at the agreed time? - Yes, we actually were able to find the Catamaran in the marina the night before our charter. How would you describe the state of your Charter Yacht? - The Catamaran was in amazing condition. Clean, decorated and adorned beautifully. Provisioned wonderfully. Everything exceeded our expectations at least ten fold. How would you describe your Captain and Crew? - The Captain and Crew were outstanding and amazing. Words alone can not describe these wonderful people. They were extremely warm and welcoming. Knowledgeable, funny, fun to be with, caring and each of them went out of their way to assure that our group had an amazing holiday. Captain Piero was a gracious host, a skilled captain and navigator. Riccardo was an exceptional cook who made sure we never went hungry and created some of the best meals we have ever had. Not to mention his kind demeanor and personality. Christian was always on the go making sure that all of the systems were operational and that we always had what we needed. Last, but by no means least, Alexandra was a blessing. Her caring personality and bright smile made each and everyone of us feel as though we were her only concern. The entire crew and captain went well above and beyond to ensure we had a great time and each of them became part of our family. Were you able to partake in the activities and itinerary you desired? - Absolutely and then some. The Captain made wonderful recommendations well as provided expert insight on our itinerary choices. What were your favorite activities and highlights during your Charter? How would you describe the quality of the meals and beverages served onboard? - All of the meals and beverages were top notch. Better than what one can get in most fine dining establishments. I would rate the meals as 5 star (our of 5) and the beverages as 5 out of 5 as well. Please add any additional comments, whether its constructive criticism or describing your satisfaction and appreciation. - I think I speak for each and every guest when I say that we cannot express enough our extreme satisfaction and appreciation to BROKER and The Captain and Crew of the Catamaran Sagittarius for making our holiday dreams and wishes come true. Everything from the first contact with Jessica inquiring about charters, to the moment we stepped of the Sagittarius was phenomenal. We each have commented on how we can´t wait to do this again and how our vacationing experience from this point forward, has forever changed. Thank you all so very much for everything. 18-24 February, 2017 ~ 5 Star Experience!! The captain was very knowledgeable about subjects and extremely accommodating with the itinerary. The food was gourmet and abundant, and the service was excellent!! There was an abundant and we ate lots of fish. We saw everything that we came to see. Thought there might be at least one more paddle board. (NOTE: new paddle board now on Sagittarius). The entire experience of our trip was 5 star, par excellance!!!!!! December 19-26, 2016 ~ Wonderful BVI Christmas! Piero knowledge of the BVI was extensive and insightful. Maurizio was always on hand as well. December 19-26, 2016 ~BVI ~ Wonderful! Thanks again for an amazing charter. That was my first one and it was an absolute blast. Thank you for your hospitality. I loved everything about this trip! Getting to know you both was a special bonus to a wonderful trip. Glad to have new friends with sweet hearts. Best trip of my life. I will think of you often. From the moment we stepped on the boat we felt like we were at home! Captain Tony and Chef Paola have been extremely accommodating and absolutely wonderful. They have shown us many beautiful places here in the BVIs and have helped create many wonderful family memories, from snorkeling near Norman Island and Cooper Island, to wakeboarding and tubing in the ocean, and the list goes on! Captain Tony and Paola are always up for anything and are always willing to go the extra mile. We cannot express our thankfulness and gratefulness enough. Paola has made the most amazing food during our entire stay and has inspired our Italian food and homemade ice cream palates! We have had many laughs and will carry many fond memories within us of the special Sagittarius, Captain Tony and Paola. They are like family to us and we hope to spend many more adventures with them in the future at sea. 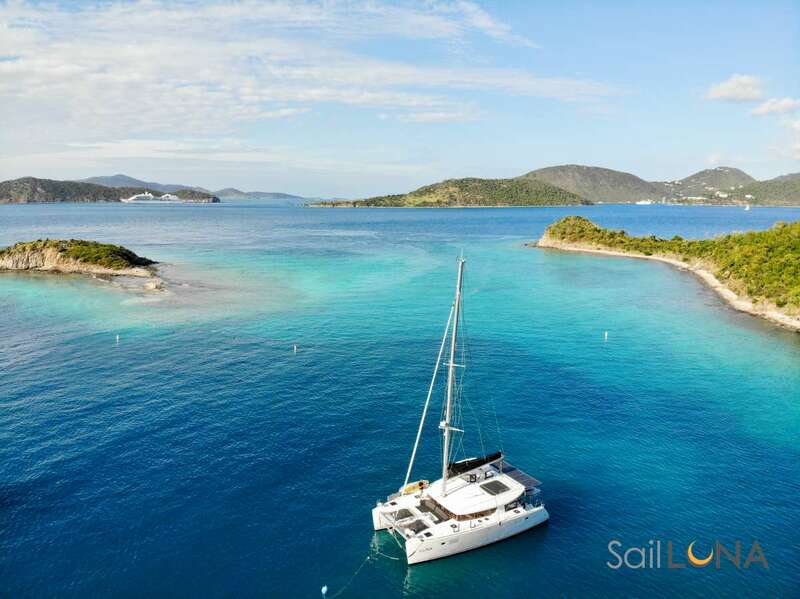 25 April - 2 May - 10 pax charter in BVI by Broker and her family. During my holiday there was another captain, Tony (the new one) is arriving now and hes very professional (hes also dive master). The hostess, Paola, is a very kind person and she cooks very well. Im sure that all clients will be satisfied! ´ The yacht is wonderful, and especially the crew that ennobles her is outstanding. There is no starry restaurant or masterchef that bears comparison with the appetizers and the kitchen of Paola . The Captain is the soul of the Sea ... after Cristoforo Colombo. Note: ´masterchef´ is referred to the popular television ´chef competition´, and ´starry´ should be translated as ´michelin guide star´: in italian ´stellato´ refers to the ´stelle´ (the valuation stars, from one to three, that the Michelin Restaurants Guide attributes to the top restaurants). Regarding the charter I can tell you that our clients were more than happy, they told this was the best holiday in their life food excellent, great crew, the boat is maintained in excellent condition, all works properly.